Incredibles 2 starts right after the end of the first film. Our heroic family, the Parrs, try to stop The Underminer from robbing a bank. They end up causing more harm than good when the Underminer’s tank causes a lot of damage. They did stop him, but there is still that pesky superhero law that forced them to go into hiding in the first place, and they lose their financial assistance on top of that. With help from their friends, they try to regain the public’s trust. How do they do it? Their friend Lucious aka Frozone (Samuel L. Jackson) has an idea. 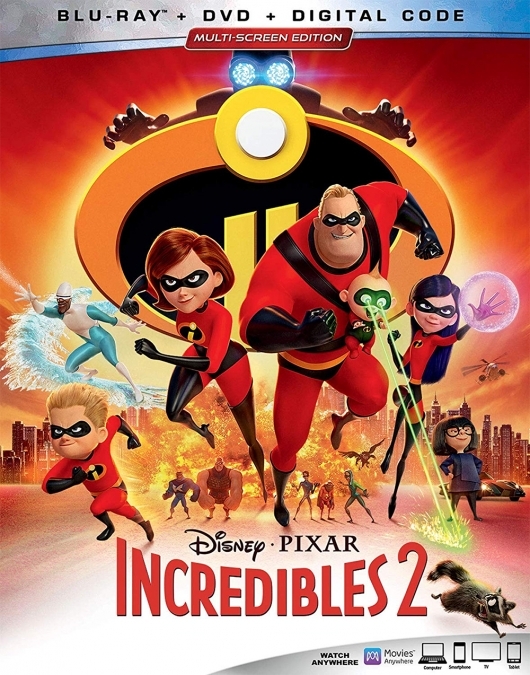 If they go with him to meet superhero fan and telecommunications Winston Deavor (Bob Odenkirk) and sister, Evelyn (Catherine Keener) for help, mom will be Elastigirl (Holly Hunter) since she does less damage, and dad aka Mr. Incredible (Craig T. Nelson) will be a stay-at-home dad, which might be the more dangerous job. 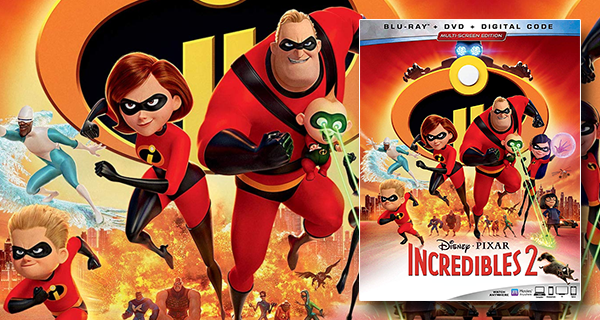 Hijinks ensue both at home with the kids and out in the superhero world, but fans of the Incredibles already know that. This Blu-ray comes with the DVD and digital code, plus bonus features. Get yours today! Bao – This is a short film by Domee Shi about a little dumpling that wakes up and cries and acts like a baby right before it is eaten, but continues to grow. Auntie Edna – This is a short film presumably taking place off-screen where Edna spends the night “babysitting,” rather studying and testing baby Jack-Jack’s abilities, sometimes to Edna’s detriment. Strong Coffee: A Lesson in Animation with Brad Bird – Ever dream of being an animator? Listen to how a master learned how to be a master, and how it was to work on Incredibles 2. Feature Commentary – Dave Mullins, Alan Barillaro, Tony Fucile (Animation Supervisors), and Bret Parker (Animation 2nd unit & Crowd Supervisor) did the commentary for the film.